The Photography Posing Secrets eBook* aims to help you understand the art of posing your subjects so you can quickly and easily find the best poses that will deliver the best pictures. Without this knowledge you will never become a professional, highly esteemed photographer. The pose that your subject strikes will directly affect the quality of the final product. If the poses are less than original or flat you will never be able to get a high quality photo worth looking at. Similarly, the perfect pose with the perfect lighting and surroundings can deliver a stunning photo worthy of the cover of a fashion magazine. Many amateur photographers think posing should be left up to the model, but that is the furthest thing from the truth. If you want stunning photos you need to have knowledge of posing so you can give feedback, direction, and suggestions to your model. The perfect poses often come from collaboration between the two of you, rather than from the mind of a model alone. What is impressive about this eBook is the great detail that it goes into regarding the human body and how it moves. Even some of the best photographers in the industry do not have a solid understanding of how the human body works, so they have to lean more on their model's knowledge which can sometimes affect their photos. The Photography Posing Secrets eBook has around 119 pages and starts with a chapter on the human body in general and then breaks it down to detailed chapters on three critical body parts: arms, legs, and the head. The chapter on the human body is enlightening and very easy to understand and the body part specific chapters take it down to small details that every photographer should know. For instance, rather than just talking about directions that you can turn the head in, you are given in-depth information about all of the moveable parts of the face. You also get valuable information about facial expressions and emotions. This is important since emotions can be seen on the face of a model in a photograph. Many photographers don't know how to manipulate this, but if you can figure that out you can take award-winning photos that demand attention and esteem. 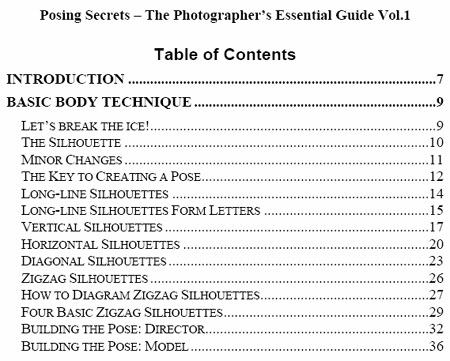 It would be impossible to read this eBook and not gain at least a root understanding of posing for photography. The finer details of the human body are combined with essential knowledge of photography and lighting so that all elements of posing are revealed. You should never have to just blindly pose a subject again, because you will understand exactly what you are doing and why you are doing it. Does Photography Posing Secrets have any room for improvement? When you come to the Posing Secrets eBook with a complete understanding of what it is about, there aren't any real disadvantages to point out. It is a comprehensive introduction to the human form and how it can be used to achieve the best poses and downright stunning photographs. The biggest complaints against the eBook come from those who are looking for a more substantial guide to photography in general. The focus of this eBook is strictly on understanding the basics of posing. If you are looking for a lot of tricks and tips of the trade in general, you aren't likely to find it here. Some also complain that this eBook only gives the most basic information about posing without going into advanced level posing strategy. This is due to the Posing Secrets eBook only being the first volume of a two volume series. The second volume does go into greater detail. While some people would prefer to have everything in one larger, more comprehensive eBook, there are some perks to having a two volume set up. The tight focus of the eBook makes it faster and easier to read through so you can start putting the knowledge into practice right away. A larger book would be too cluttered, more difficult to get through, and would take much longer to digest and incorporate into practice. So who would enjoy Photography Posing Secrets and find the valuable content useful? You have to look at the Photography Posing Secrets eBook for exactly what it is: a quick, informative, highly detailed introduction to photography posing. After reading it you should have a very clear understanding of how the human body works and how it can be manipulated to take the best photos possible. Besides just posing your model's body as a whole you will start posing individual fingers, ankles, and eyebrows. You will understand how those tiny details can make a huge difference in the final product. As a result, your photography skills will become more advanced and you will start to take more professional quality photos and fewer complete flops. If you are looking for a comprehensive overview of photography in general, then this is not likely to satisfy you. If you are looking for very clear, in-depth information on how to pose models to get the best photos, then this is the best resource available anywhere right now. The smaller details in each chapter will take your photos to the next level or even ten levels up if you are a complete amateur. You will learn things that many professional photographers don't know and that gives you an advantage if you are looking at photography as a way to make money. 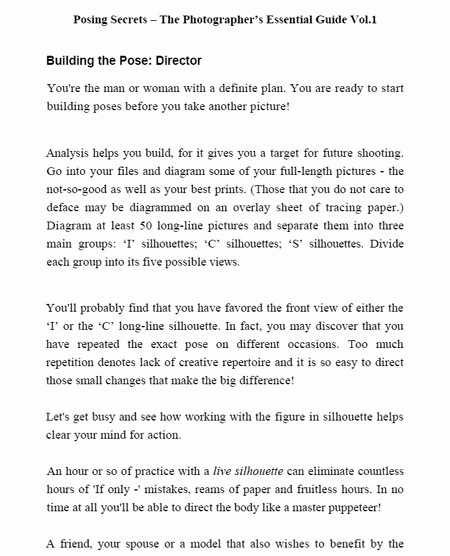 Below is an excerpt from a page at the end of the first section of the eBook about building a pose. There is one of these sections at the end of each chapter which shows you how to bring together everything that you have just learned and create a pose. The Photography Posing Secrets eBook is a great resource for anyone who struggles to come up with great poses or who uses the same poses over and over. If you have previously relied upon your subjects to find their own poses, you are not getting the best shots possible and are holding yourself back! 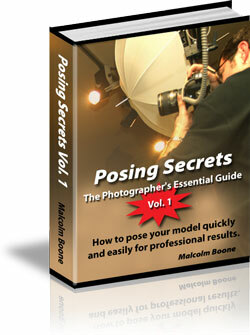 The Posing Secrets eBook will take any photographer to the next skill level by helping them understand the human form. That knowledge transfers into better pictures as you understand how to pose your subjects from the overall pose to the small details like the position of the lips or the curl of a finger. If you have enjoyed reading my review of 'Photography Posing Secrets' and would like to continue your research, click here to find out more.